Henrik Stenson heads the field in the Tour Championship, presented by Coca Cola in the first round at East Lake Golf Club. 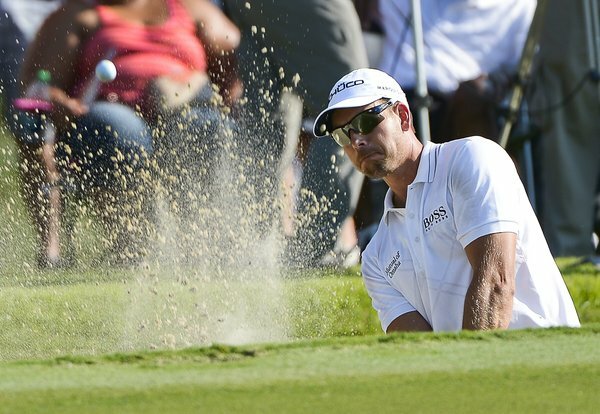 Henrik Stenson / Tannen Maury/European Pressphoto Agency Last week Henrik vented his anger at shooting a 74 in the last round of the BMW by beheading his driver and damaging a locker. He was all calmness and serenity today as he breezed around East Lake Golf Course in -6 under par 64, to top the leaderboard. Speaking of his meltdown and his round today, Henrik said; “This was a good turnaround mentally. I stayed very levelheaded. Kept the head on , on both myself and my driver. It kind of builds up and eventually it goes over the limit, I just needed to realize the world is a good place again, I was just tired, and I pushed myself over the edge. That’s not the best frame of mind to play good golf. I’m really delighted with the change I made. I love playing great golf courses, and obviously this is one of them. ' Henrik also has a troublesome left wrist, but hopes some ice will improve the condition; “I hope it’s just a one-off that will go away,” Adam Scott is alone in second place at -5 under par with his opening round of 65. Billy Horschel and Steve Stricker are in third place at -4 under par with their first rounds of 66. The tournament favorite and World number one Tiger Woods recorded three bogey's and no birdies in his opening round of +3 over par 73.